War between the U.S. and China, inconceivable just a decade ago, is now a regular topic of analysis and conversation. Lt. Gen. Ben Hodges, the just-retired commander of the U.S. Army in Europe, suggested conflict with the People’s Republic could come soon. “I think in 15 years—it’s not inevitable—but it is a very strong likelihood that we will be at war with China,” Hodges said last Wednesday at the Warsaw Security Forum. His stark assessment was followed, as it happened, by bellicose statements from Chinese ruler Xi Jinping and his defense minister. So I called Hodges over the weekend for clarification, and his estimation of the situation was in many respects even more grim than his remarks in Poland. What could be even worse than a Chinese attack? A simultaneous Russian assault in Europe on top of a Chinese attack is the worst “worst case.” The United States just isn’t ready to fight Russia and China in a two-front struggle. This stark assessment came at the same time Chinese ruler Xi Jinping and the country’s defense minister issued bellicose statements. Also Thursday, Chinese ruler Xi Jinping ordered the Southern Theater Command of the People’s Liberation Army (PLA), which covers both the South China Sea and Taiwan, to “prepare for war.” Because no country is threatening China, Xi must be thinking one option is to launch an attack in the not too distant future. At the moment, the Navy is at 286 Deployable Battle Force Ships. That, according to those who study China’s navy, is too small. President Donald Trump has called for a 355-ship fleet. Fanell argues for a 600-ship one. A doubling of the fleet, however, would seem impossible within budgetary constraints. Trump has just ordered a reduction in the Pentagon budget to $700 billion for Fiscal Year 2020. As big as that number is, Russia, and especially China, are rearming. The PLA Navy already has more vessels than the U.S. according to some counts, and it is adding a new warship every other month. Moreover, Beijing has militarized to an unprecedented degree its coast guard and the “little blue men” of its fishing fleets. In a conflict, Xi will be able to bring to bear all his forces at the point of attack, and the U.S. Navy will be spread around the globe. You go to war, as is often said, with the military you have, not necessarily the one you need. “If you think of World War II, all of the events that led up to the beginning of where the U.S. went into World War II, actually it was years, thank goodness the U.S. Navy was anticipating a potential war with Japan so that they were already developing the right kind, we had all these aircraft carriers,” Hodges said. In an echo of the 1930s, the U.S. Navy is not now configured to deal well with expected challenges. As Jerry Hendrix points out in The National Review, America’s fleet does not have, among other things, carrier-based drones able to hit Chinese targets at great standoff distances. That time frame roughly coincides with what Fanell and others call the “Decade of Concern,” the 2020s. China’s flag and mid-ranking officers, nourished in virulent anti-Americanism, are itching to fight Americans, and the circumstances are aligning so they just might get that opportunity. Xi Jinping has staked his career on taking on America. Unfortunately, he may see a closing window of opportunity to do so. A crumbling economy, tumbling demography, and deteriorating environment might lead him to believe that he must act now or lose his chance forever to accomplish historic goals. Xi’s biggest problem is that, as absolute leader, he must now accept total responsibility for worsening relations with the United States and serious dislocations at home. There is, simply, no one else to blame. 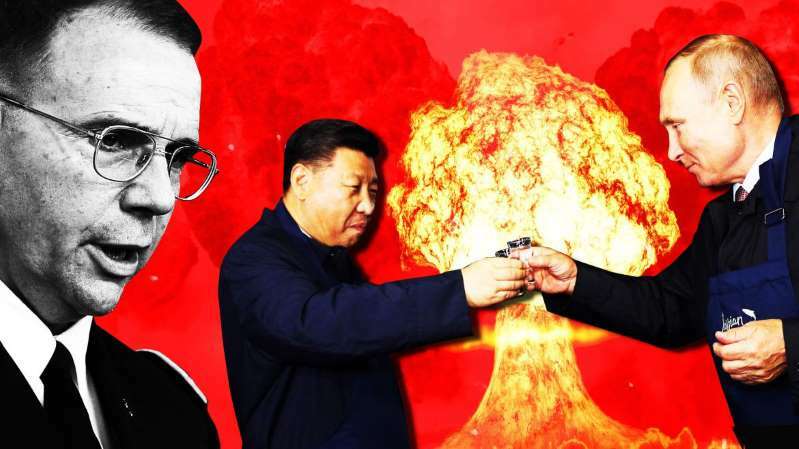 And because he has de-institutionalized the Communist Party—he has junked all the rules that constrained his power—he is vulnerable to no-holds-barred retaliation from his political enemies. Xi, during his half-decade atop the Chinese political system, has increased the cost of losing political struggles. China’s ruler, therefore, has no Plan B, because having to back down in the face of U.S. pressure could lead him to lose power, his freedom, and his life. For the first time in more than a generation, China has a leader who has an incentive to risk it all. Xi Jinping, therefore, could take China over the cliff with him. We are now entering that decade of great concern.